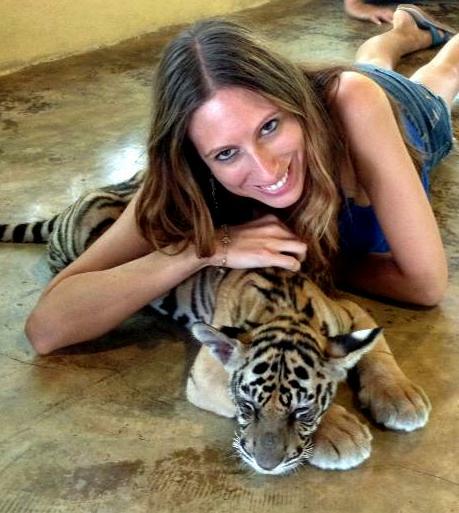 There is a lot of controversy over the tiger attractions in Thailand. 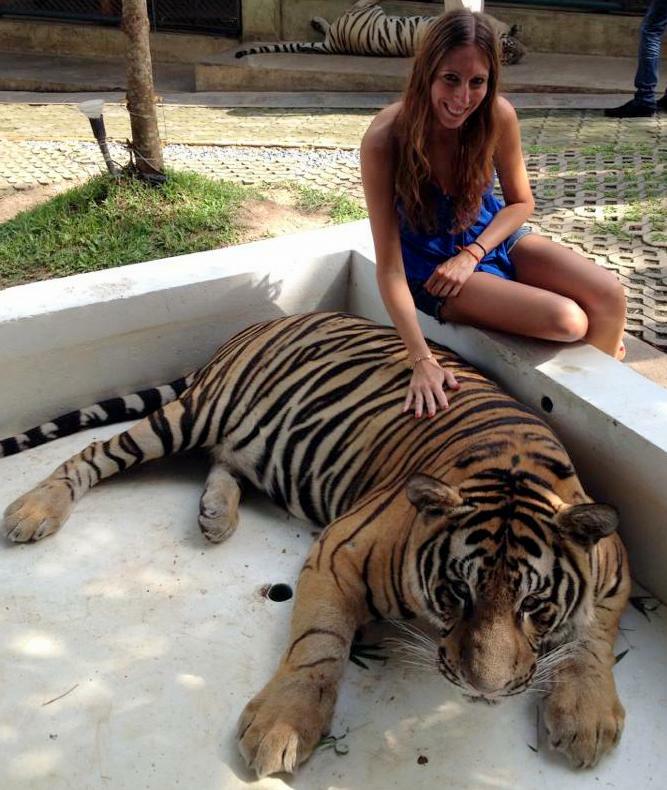 It is a known fact that one of the most popular, the Tiger Temple abuses the animals and does not treat them properly. Fortunately they are not all like this, so I decided to visit Tiger Kingdom, where I saw no signs of abuse. Granted, it could of course happen behind the scenes that we are unaware of, but I did some research and was unable to find any red flags. When I went, I felt like it was a legitimate place and I had a great experience. There were four different sized tigers; smallest, small, medium, big (and woah that’s big!). You can pay to see all sizes or just a particular one. They are held in huge “cages”, not trapped in a small enclosed space all day or chained down. The word cage is actually a misleading word because the area was so large it was more like a huge play pen with trees and bathing pools. 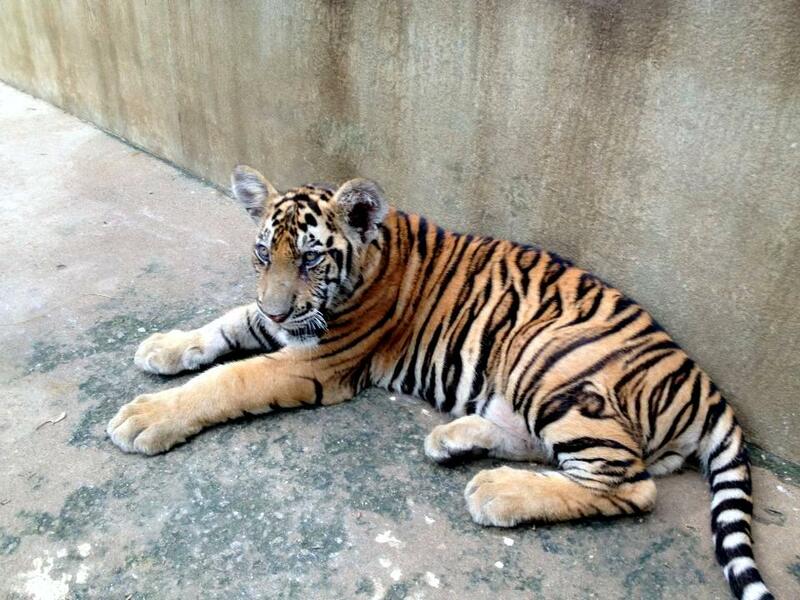 First, I went to see the smallest tigers. They were adorable! I was hesitant to go near any of them since they were jumping around and playing. Do not think for a second that they are allowed to do this, because they were declawed or had their teeth scraped down or removed. They have not been altered at all. I tried to hold one of them but he was too hyper so I laid besides him, petting and playing with him. Then, I went to visit the big boys. As I walked up to see them, a worker pulled up a fence and let me into their play pen. It was unreal. 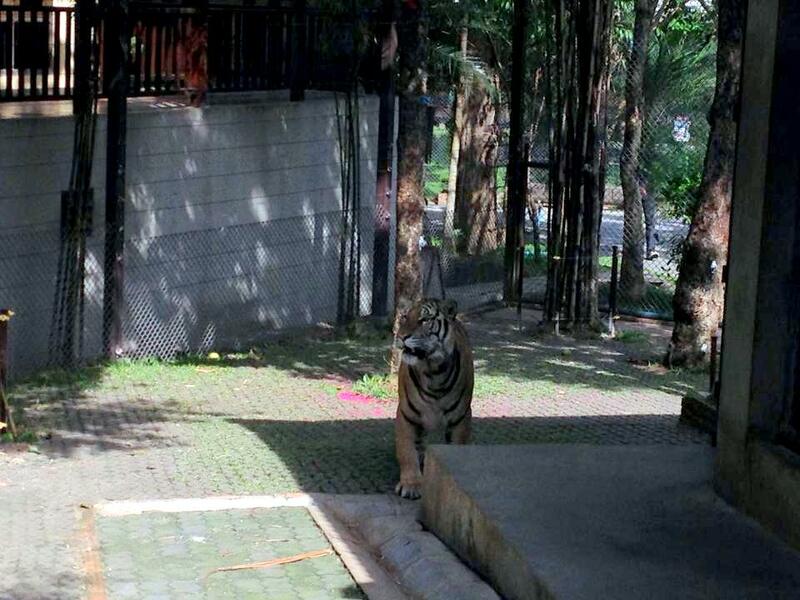 As soon as I walked in, one of the tigers walked past me without flinching. I felt like I was thrown into a meal pit. I hop they ate already! What did I get myself into? You have a guide that is with you at all times, who tried to entice them to come over to us for a photo. We finally got one to come over and sit next to me, but he eventually got bored and decided to walk off after a few photos. Oh… and scared the crap out of me (as you can tell in the photos below)! 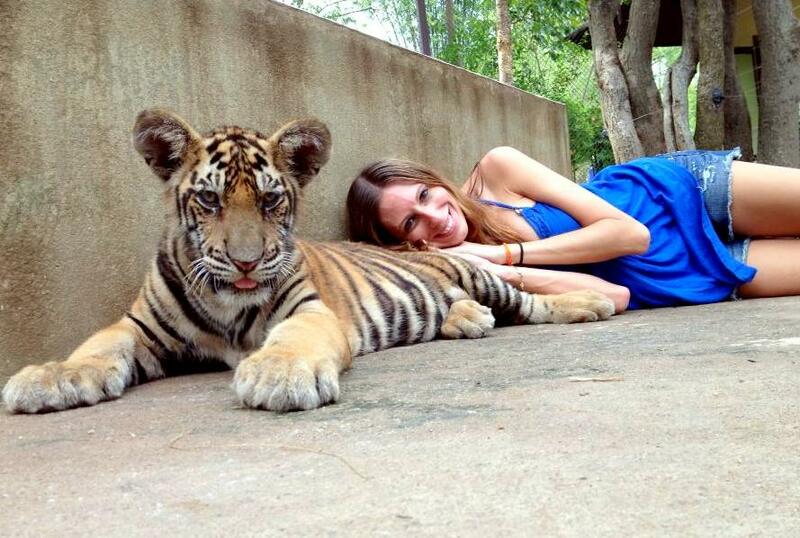 There I was, smiling for the camera with the tiger sitting next to me until he suddenly got up and walked off. Talk about giving me a heart attack! Afterwards, I went to see the small tigers. Surprisingly, they were the most hyper of the groups I saw. I was with a large group of girls so we sat on a log, watching two of the tigers playing with each other. 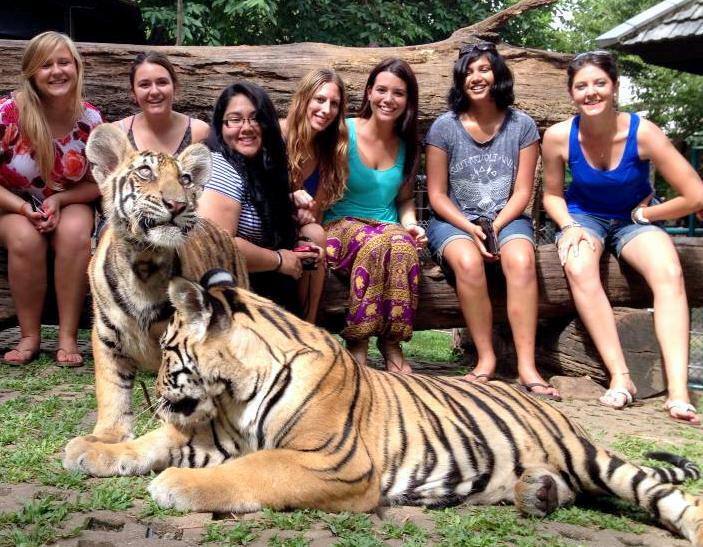 One of the workers took photos of us watching them play until one of the tigers decided to come over and say hi. 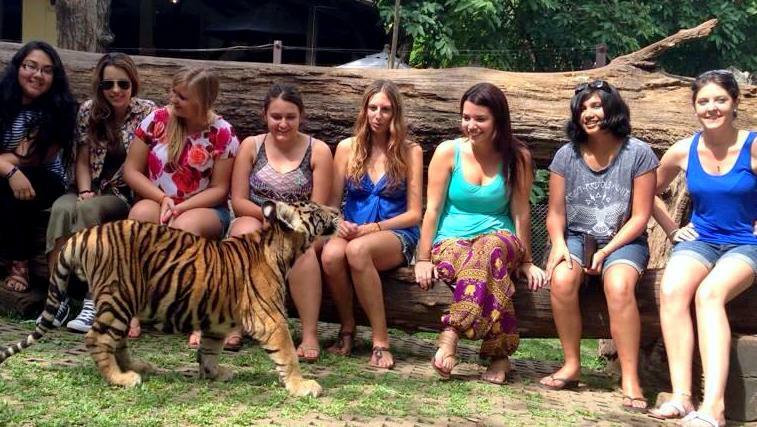 As you can imagine, a tiger running over to a group of girls was pretty hysterical. Everyone jumped up as an initial reaction and of one the workers got some great photos in the moment! 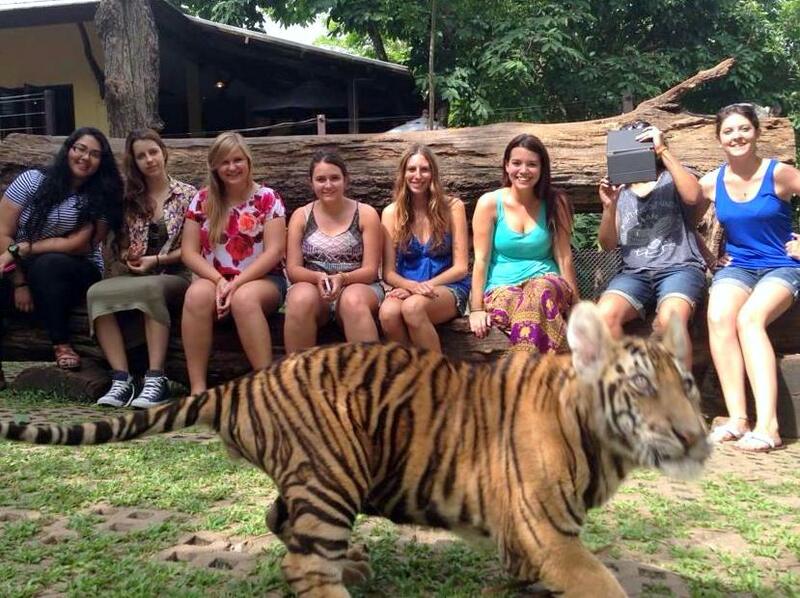 If you do decide to go to one of these attractions, then I would recommend Tiger Kingdom. Not only did I have a great time, but the tigers were awake, alert and not being mistreated. I did have a few nervous moments, so this is not for the faint of heart, but it was a fun, unique and daring experience that I will never forget. Who else can say they hung out in a tigers playpen?